Studio Players, in cooperation with Sheboygan Theatre Company, is proud to announce its 4th Season, to be performed at the Paradigm Annex from Fall 2015 through Spring 2016. The 4th Season kicks off with Studio Players’ first foray into musical theater with The Rocky Horror Show, music, lyrics and book by Richard O’Brien. Brad and Janet come upon the home of the sweet transvestite, Frank ‘n’ Furter, and his gang of misfits. This kitschy rock ‘n’ roll sci-fi gothic is perfect for the Halloween season, and Studio Players will celebrate with a special midnight performance on October 31. The rest of the performances will run October 29-31, 2015 at 7:30 p.m. In Jonathan Tolins’ deliciously funny send up of a pop icon, Buyer & Cellar takes a real setting (the boutique-style basement of Barbra Streisand’s California estate) and imagines what it would be like to be the shop keeper of Ms. Streisand’s mini mall. One actor takes on seven roles in this fast-paced and witty one-act play. 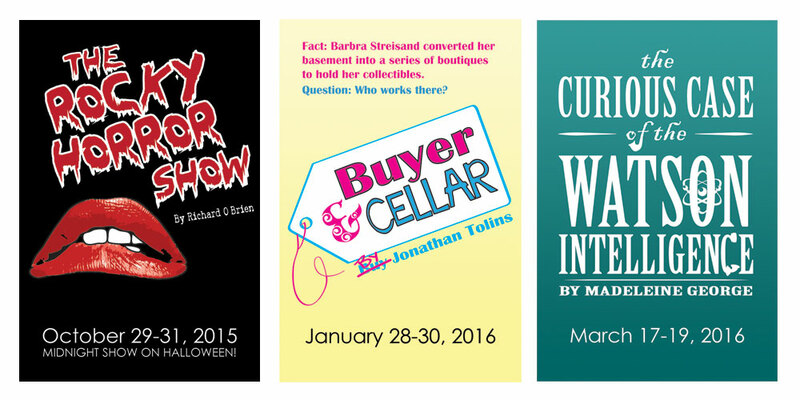 Performances are January 28-30, 2016 at 7:30 p.m. Finally, Studio Players takes our audience on a time-bending adventure in The Curious Case Of The Watson Intelligence, by Madeleine George. The titular “Watson” refers to Sherlock’s right hand man, Alexander Graham Bell’s assistant, the super-computer/Jeopardy! champion, and a regular IT worker trying to make sense of life and love in the modern day. A small cast embodies many -roles as the play jumps back and forth in time and space. Performances are March 17-19, 2016 at 7:30 p.m.
Tickets for shows will be available for purchase online and in person at Paradigm Coffee & Music a few weeks prior to each show. Audition information for each production will be found on www.StudioPlayers.net. Find Studio Players on Facebook and follow @StudioPlayersWI on Twitter for updates as they happen. If you have any questions or would like to get involved with Studio Players, please contact studioplayers@outlook.com. For more information on Sheboygan Theatre Company’s 82nd season, visit www.SheboyganTheatreCompany.com.